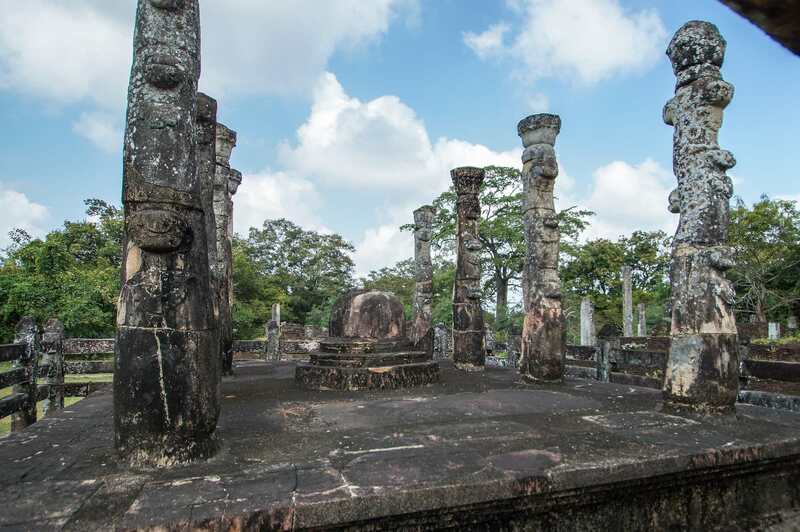 Along with Anuradhapura and Kandy, Polonnaruwa is one of the key points in Sri Lanka’s Cultural Triangle, an area which contains much of the impressive ruins of pre-modern Sinhalese kingdoms – mostly religious structures and monuments but also some secular buildings. 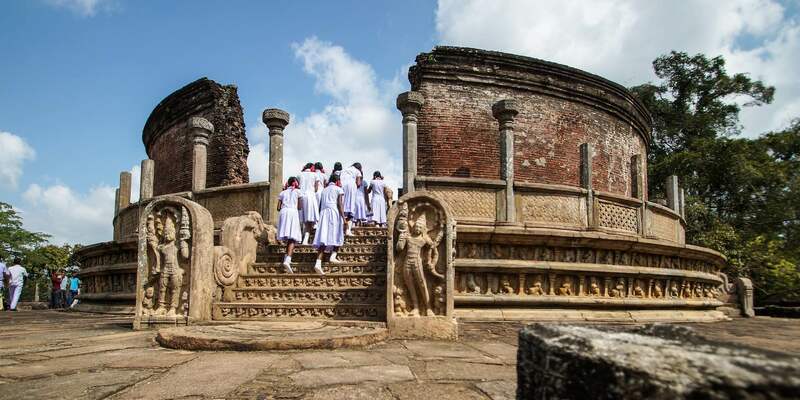 A visit to Sri Lanka which focusses on more than sun and surf and wildlife preserves will take you to this area and introduce you to Sinhalese accomplishments of a millennium or two ago. 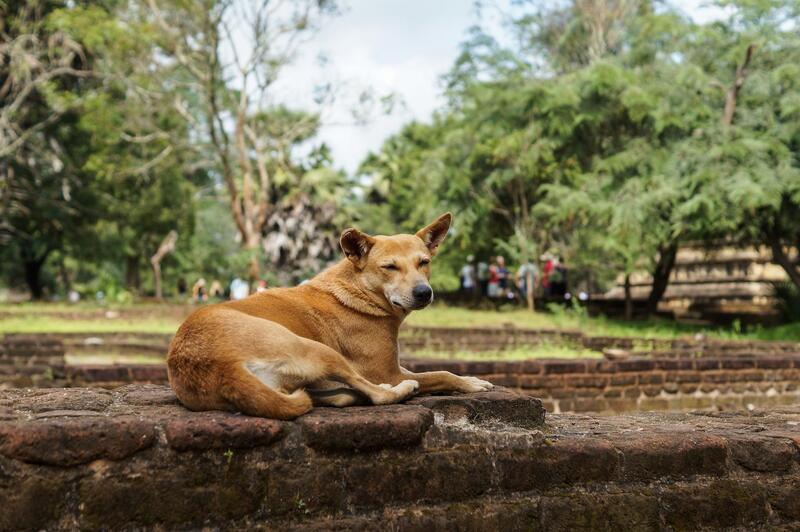 What I Did – Using Dambulla as my base, I set off at 7 a.m. from my hotel on the outskirts of town and was at the entrance of “The World Heritage City of Polonnaruwa” by 9:00. Nearby was a bike rental stand where I picked out my ride for the day. My taxi driver would wait at the entrance while I cycled up and down the roads passing through the site. 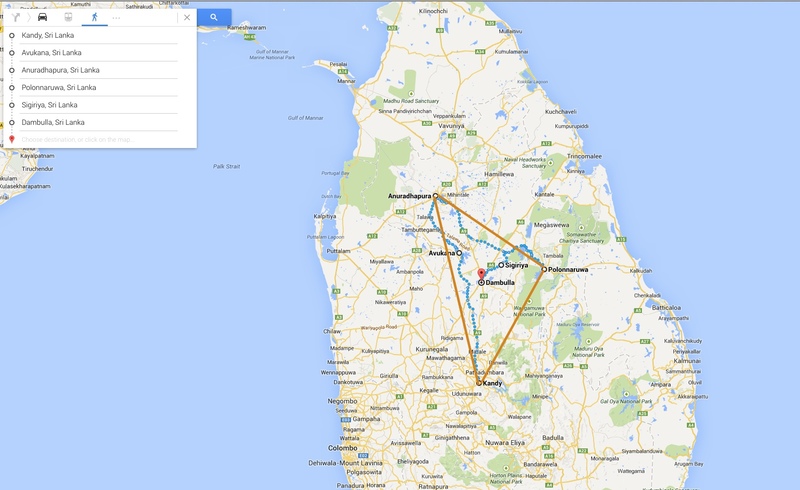 What I Should Have Done: Arriving in Polonnaruwa the afternoon before would have been the thing to do. The location of The Lake House makes it sound like a great place to stay for the night. The Rest House would be another option. 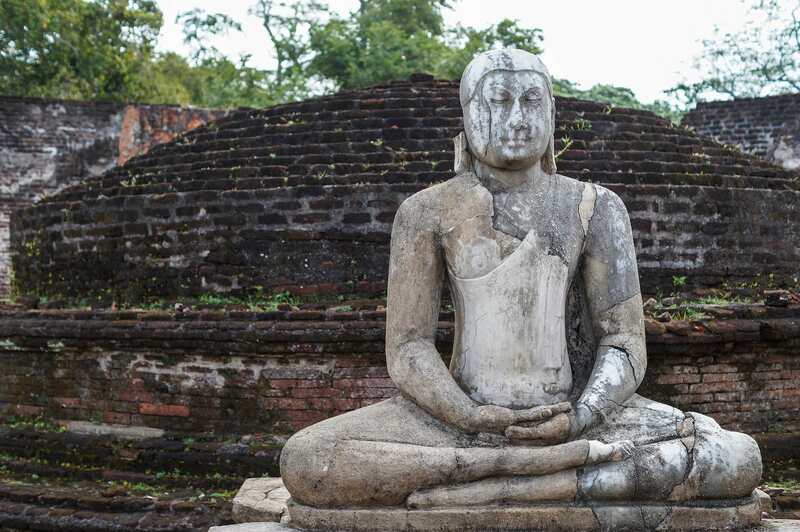 It is close to Pothgul Vihara (#1) and the Statue (#2) which do not require an entry ticket. I would have paid them a 30 minute or so visit and then walked the path along the shore of the artificial lakes. It would mean that the next morning I could begin my tour in the cool of the early morning – the site opens at 7:30 a.m. and the ticket costs US$25. I would also scrap the bicycle idea and, as I would later do in Anuradhapura, hire a tuk-tuk driver instead. This way my energy could be spent visiting the sites and not simply getting to them as the day gets increasingly hot. Having a tuk-tuk driver who has done the tour a hundred times also means you will approach the various sites from the right entrances and make the most efficient use of your time. One last thing I should have done is have a better idea of the historical context of the site before I visited; this would have helped me make more sense of what I was seeing while I was actually there! This post is my attempt to understand more clearly what the images are showing. I guess it is better late than never! Some imagination is required to reconstruct what a thousand years have taken away! Who had the structure built and what its purpose was are still unclear. Given the many projects undertaken during the rule of Parakramabahu I (1153-1186), some attribute it to his builders. 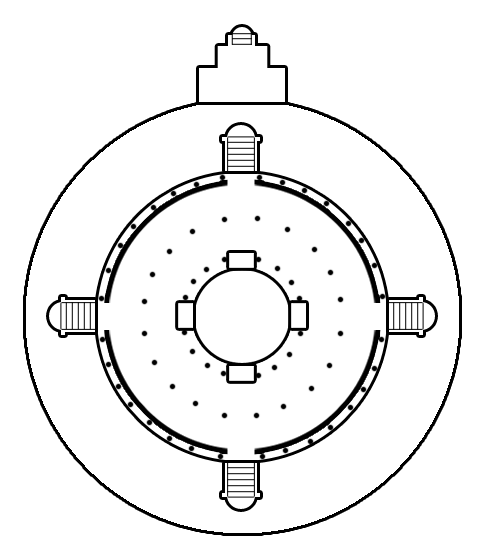 There is also some doubt about what the exact purpose of the structure was, with a library or an image house being the two most popular explanations. 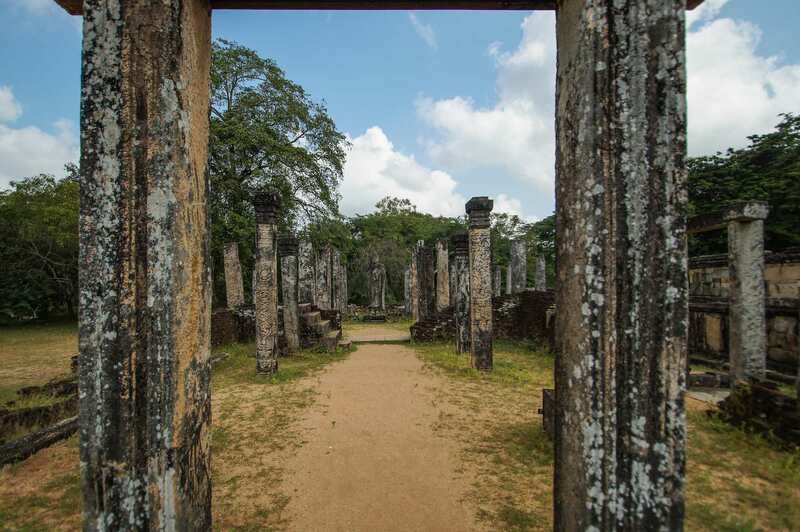 Given that there is only one entrance to the inner room and it faces east, this would seem to indicate a gedige-style image hall, a late architectural development in Sinhalese architecture characteristic of Polonnaruwa. A Youtube video – see here – may help you visualize what you’ll see if you pay a visit. The other nearby attraction is the 3.4 meter (11’2″) statue of a male figure carved out of the rock face. Again, the exact age of the work and the identity of the figure are open to debate. 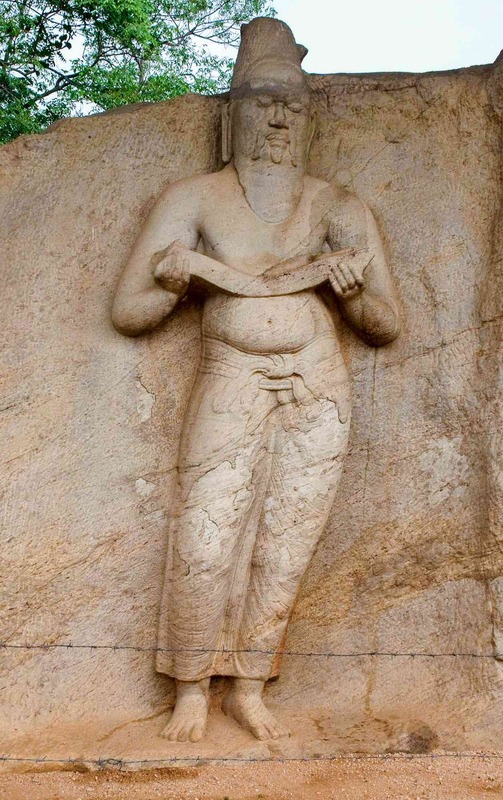 If it is indeed a depiction of Parakramabahu then it would date to the 12th C during his reign. It may be, however, a depiction of the legendary founding sage of the city, Pulasti Whoever it is, he seems to be holding a scroll, probably indicating a religious text. Given all the other work done during Parakramabahu’s time, he may well have commissioned his artists to pay homage to Pulasti – or to himself. For a couple of centuries (1060 to 1300 C.E.) 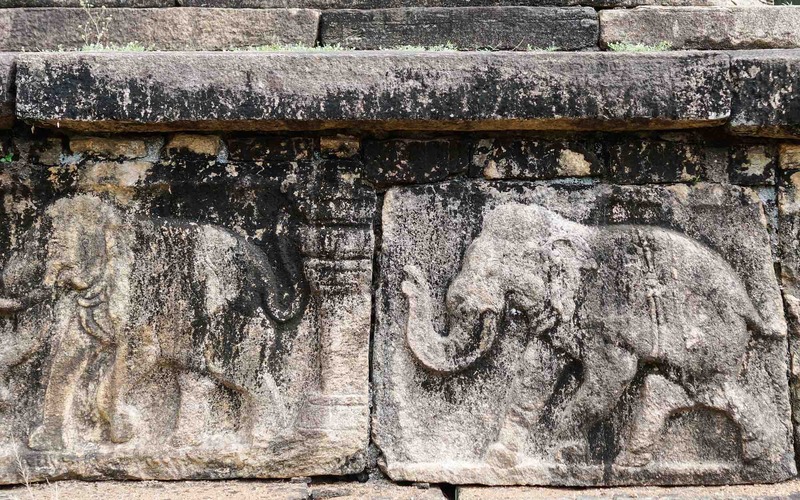 Polonnaruwa was the capital of a Sinhalese kingdom that tried to recapture the glory of the previous one based in Anuradhapura. 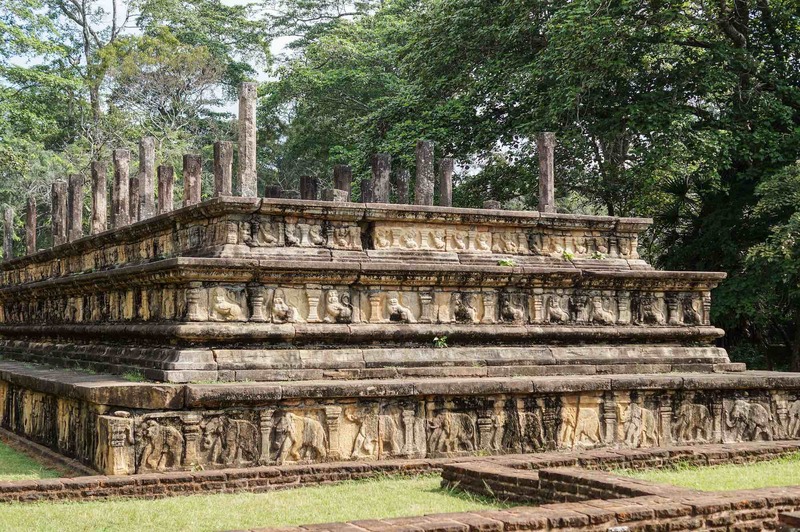 Ironically, it was the invading Cholas from south India who first chose Polonnaruwa as their capital in Sri Lanka after their sacking of Anuradhapura around 1000 C.E. 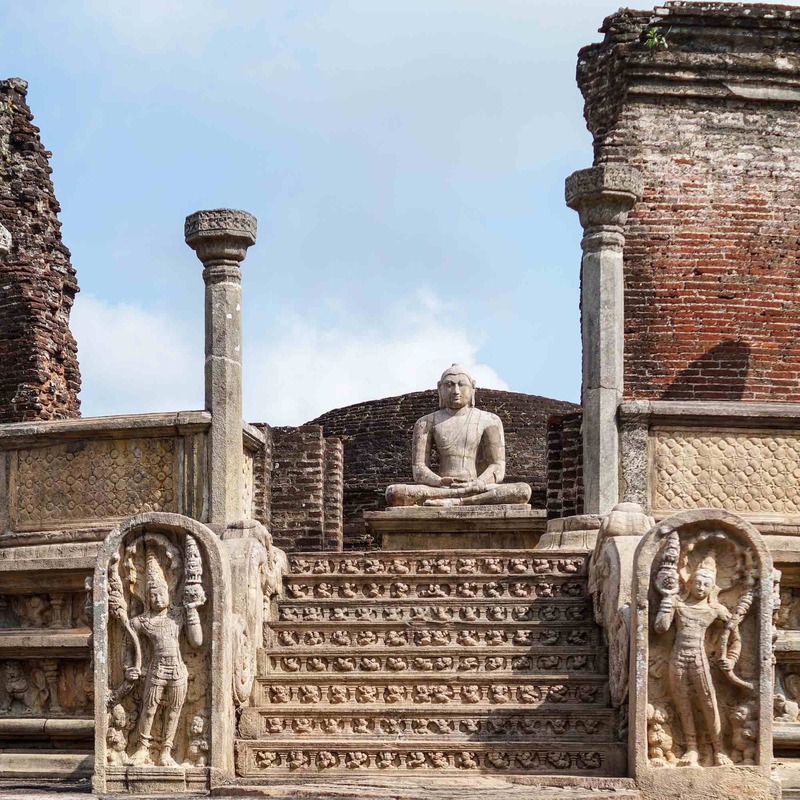 It would be another 75 years before the Sinhalese would take back control of the island; Polonnaruwa continued in its role as the kingdom’s capital. The city was located in a fertile corner of the plains to the north of the hill country at a major crossing on the Mahaweli Ganga River. 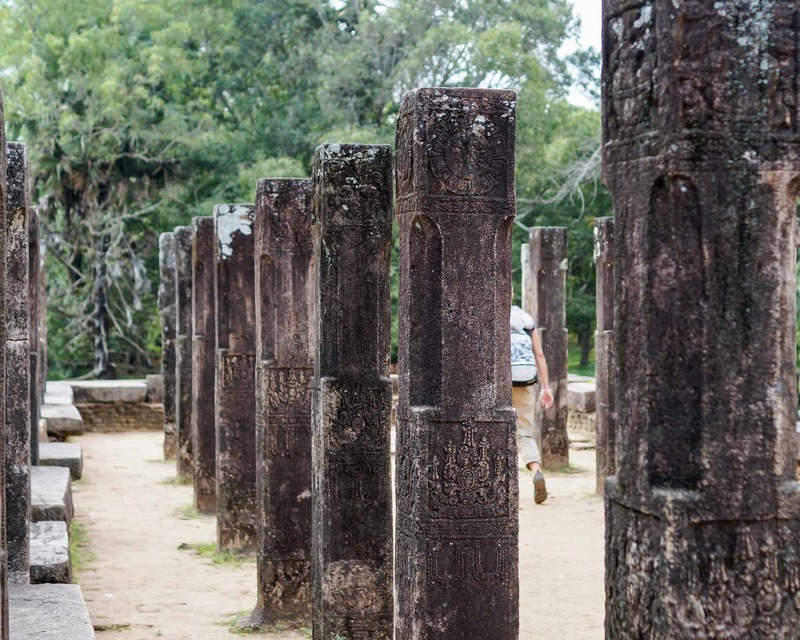 It was also more easily defended than the very exposed city of Anuradhapura to the north. With the creation of artificial lakes – i.e. resevoirs or tanks – and further irrigation, the area would become even more productive. 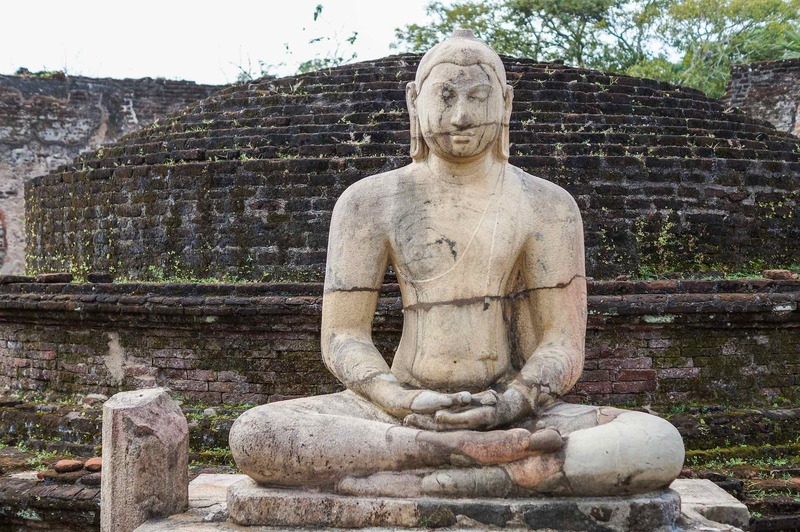 In a time when agricultural productivity was the very foundation of a successful kingdom, Polonnaruwa fit the bill as the capital of a thriving state. My tour began at the south end of the site near the entrance with the Citadel area. It is here that the rulers of the city – beginning with Vijayabahu I and then continuing with Parakramabahu I and his successors – built their palaces and other government buildings. The first ruins I walked through were what is left of Parakramabahu’s Palace. The heavy brick walls of what was the multi-storey Royal Chamber still stand. Evident at the top of the brick walls are the holes that would have held the wooden beams on which additional floors of the palace were built. One story has it that the palace had a thousand rooms, a fanciful number meant to convey the immense power and wealth of the king. 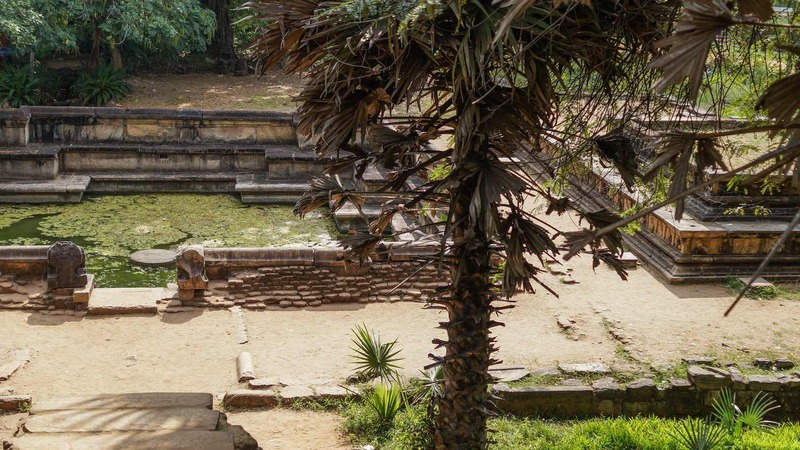 Not far away from the remains of the Palace is another structure built during the time of Parakramabahu, The Council Chamber or Audience Building. Still intact is the multi-layered base of the building and some of the columns on the floor of the chamber that would have held thew wooden roof. 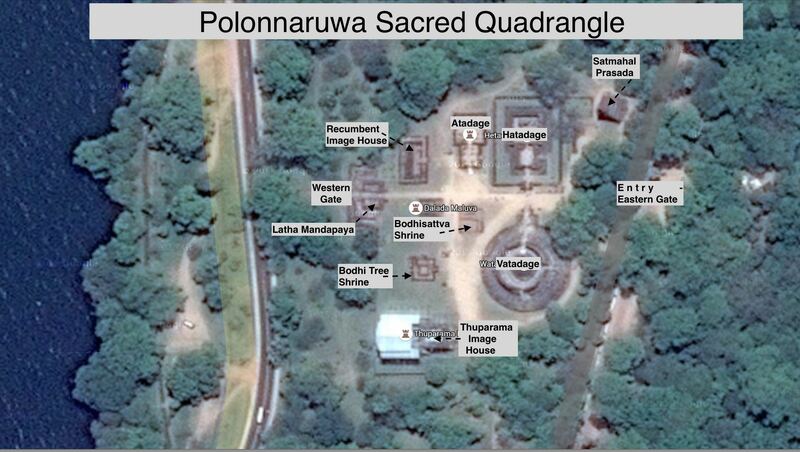 Polonnaruwa’s period of greatness lasted about two hundred years but after 1300 C.E. it was abandoned. The dams which created the artificial lake fell into disrepair and people moved further south as new Indian invaders arrived. It would be the British in the mid-1800’s who would come upon the ruins of the city and begin extracting the ruins of a once major Sinhalese capital and important Buddhist centre.Here is what the Council Chamber looked like in 1870 before archaeological work began! On the platform of the Council Chamber there were four rows of pillars or columns which supported the wooden roof. 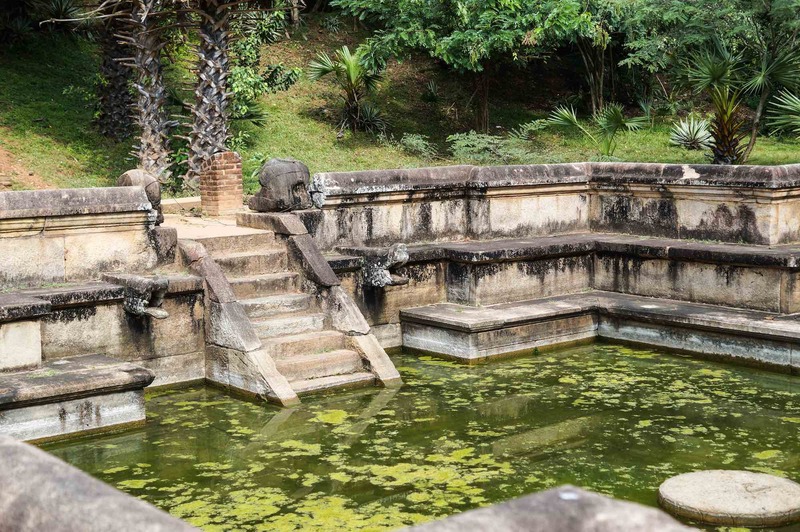 Not far from the Council Chamber – and just outside the walls of the Citadel – is yet another construction attributed to the reign of Parakramabahu I – The Royal Baths (Kumara Pokuna). In the middle of the cruciform-shaped pool is a circular stone which along with the raised platform all around the edge of the pool may have served as a resting spot for bathers. 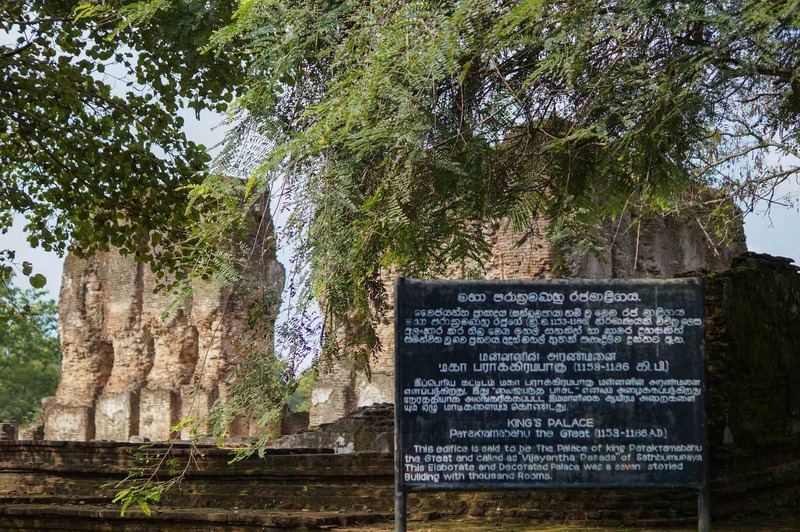 North of the Citadel area, I would bicycle to the religious heart of the ancient city – the Dalada Maluwa, renamed The Quadrangle by British archaeologists in the late 1800’s. I would find there what the current edition of The Rough Guide describes as “home to the finest and most varied collection of ancient buildings in Sri Lanka”. 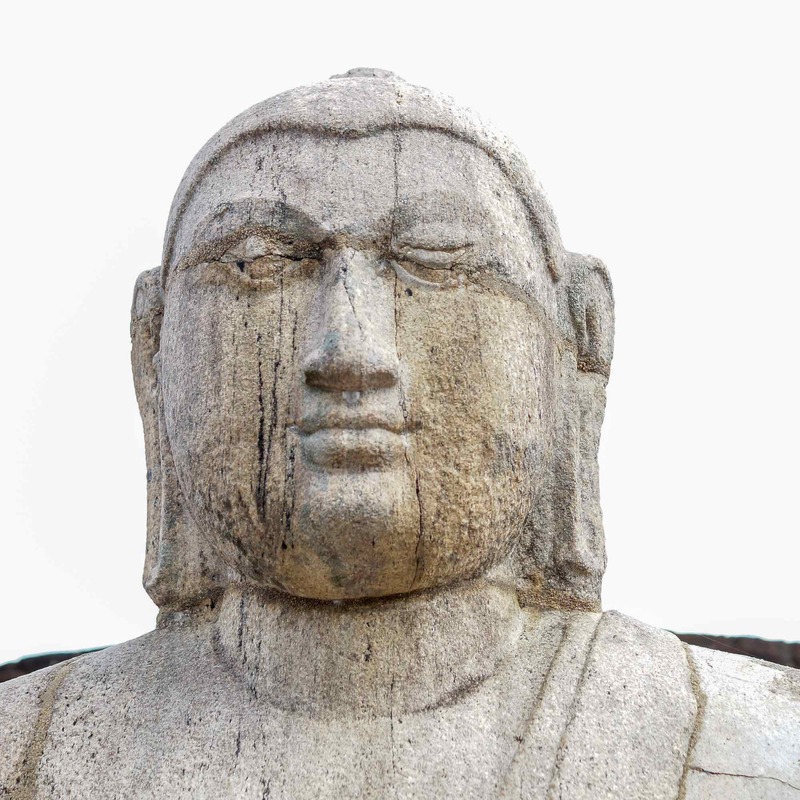 The Sinhala word dalada means “tooth”; it refers to a supposed tooth of Siddhartha Gautama, the historical Buddha, which ended up in Sri Lanka. To the Sinhalese it is the powerful talisman. It reminds me of the Palladium from Graeco-Roman myth, the wooden statue of Athena created by the goddess herself which Aeneas took with him when he fled his city to found a New Troy called Rome. His very possession of the Palladium gave him his legitimacy. Christian equivalents would be a splinter from the Cross or the grail from the Last Supper. The Dalada – The Tooth – symbolized the political legitimacy of whoever held it. 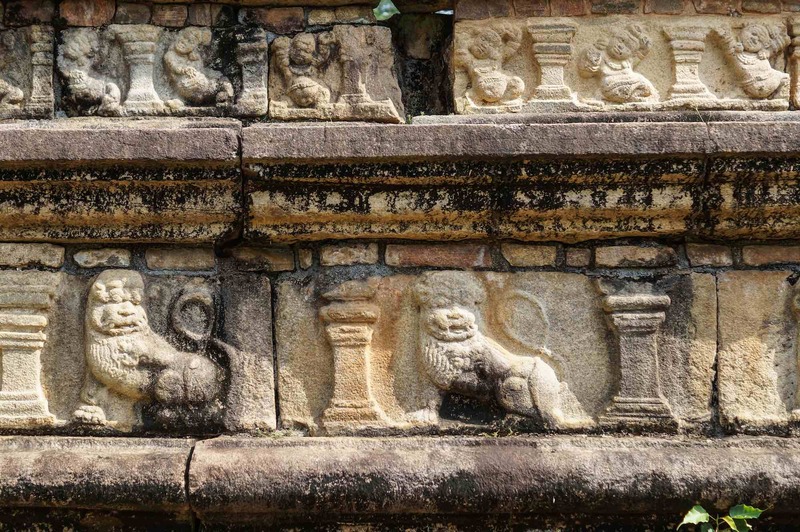 During Anuradhapura’s time as the capital it had been kept there. Now, for a brief time, the Dalada Maluwa area would be its home. 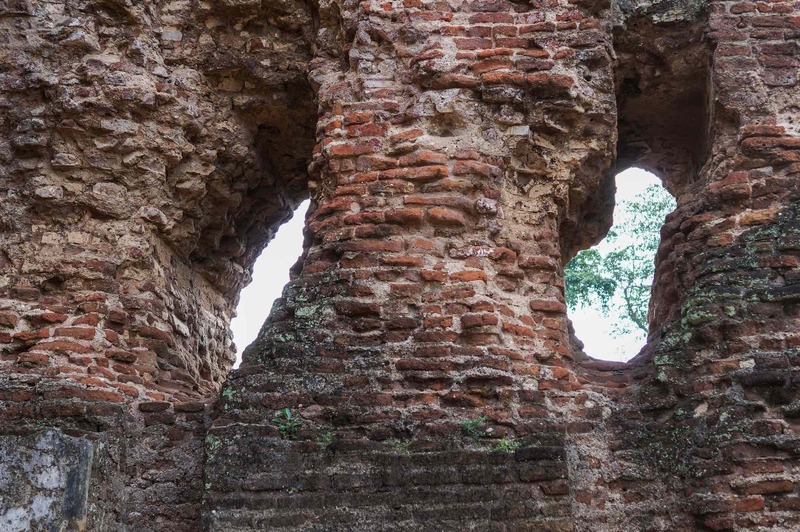 These days The Tooth is found in Kandy, the last Sinhalese capital before the British take-over of the island the 1800’s. First up was The Vatadage (Circular Relic House). This Youtube video is a great introduction to the building and its layout. Missing is the wooden roof which covered the original structure; supporting wooden beams would have rested on the pillars as they sloped down from the top. 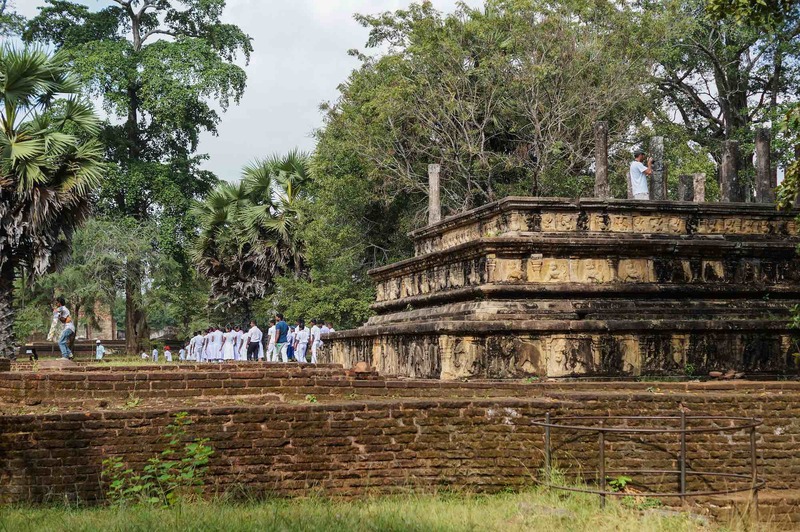 The steps lead to the main platform of the Vatadage with its small stupa at the very centre. 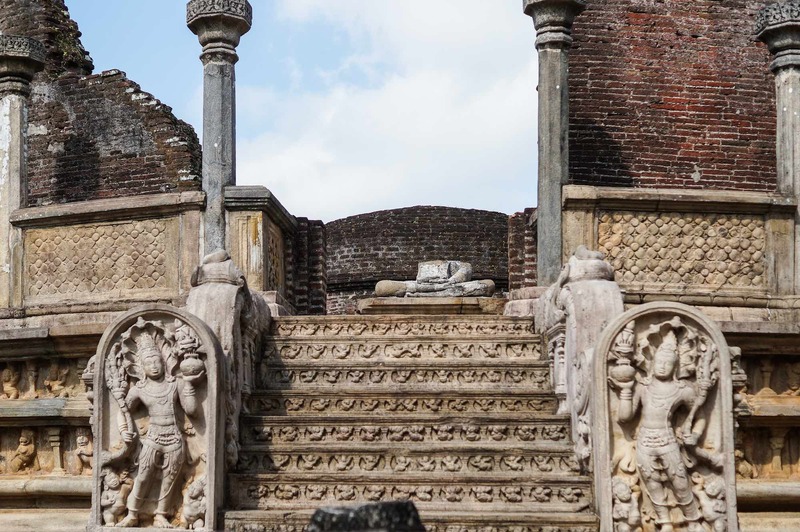 The guardstones on the sides of the steps – considered among the finest of their type in all of Sri Lanka – are the usual nagaraja (snake king) figures holding items which connote abundance and wealth. 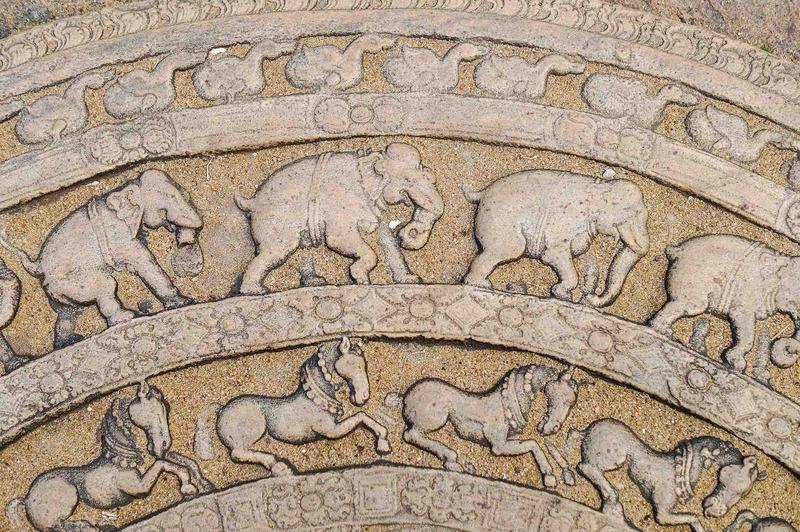 At the foot of the steps is another Sinhalese architectural feature – the moonstone. 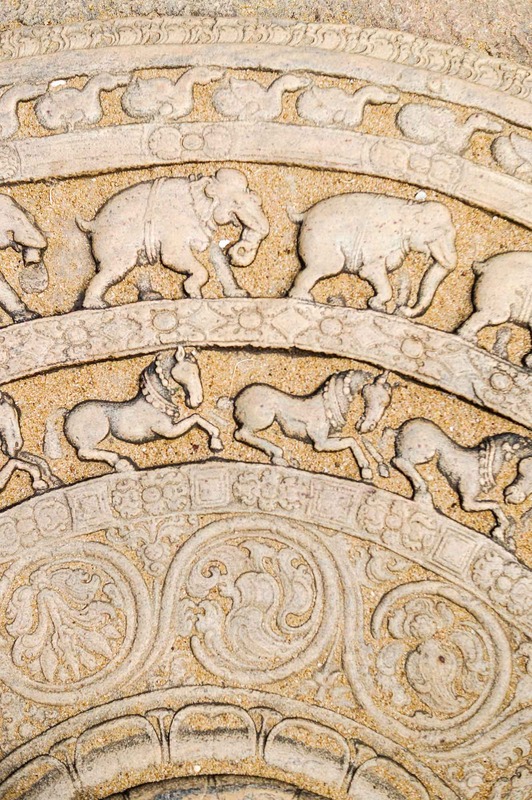 this one has exquisite carvings of (starting from the center) lotus flowers, horses, elephants, and geese. 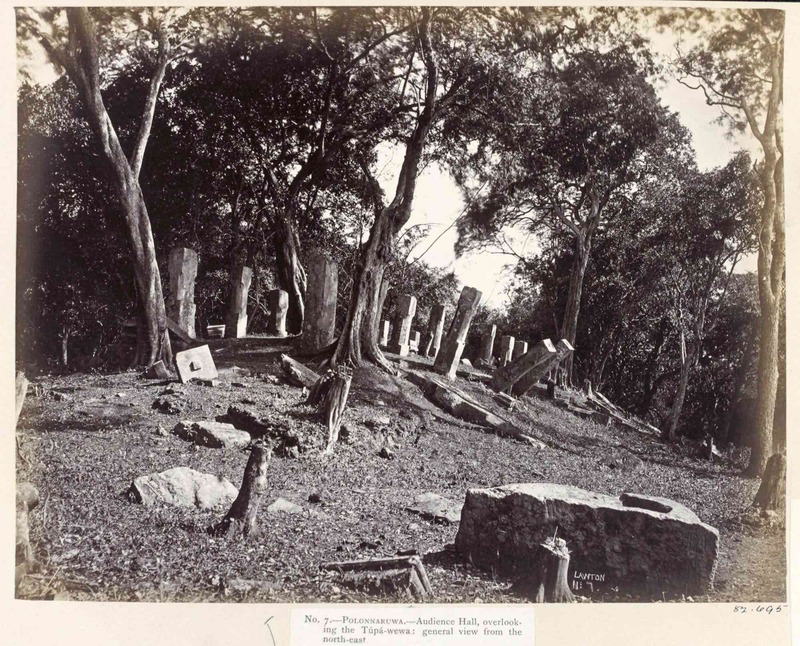 Again, to put things into historical context, here is what the Vatadage looked like in 1870 when the British photographer Joseph Lawson took the image shown below. As incomplete as the buildings are today, they have come a long way from the state they were in less than 150 years ago! 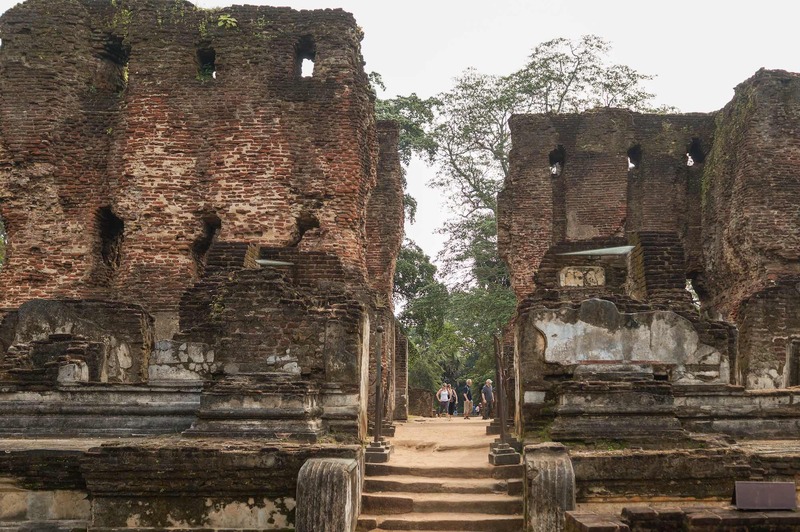 Along with cricket, the Sinhalese can thank the British for beginning the process of uncovering the physical remains of their glorious Sinhalese past! 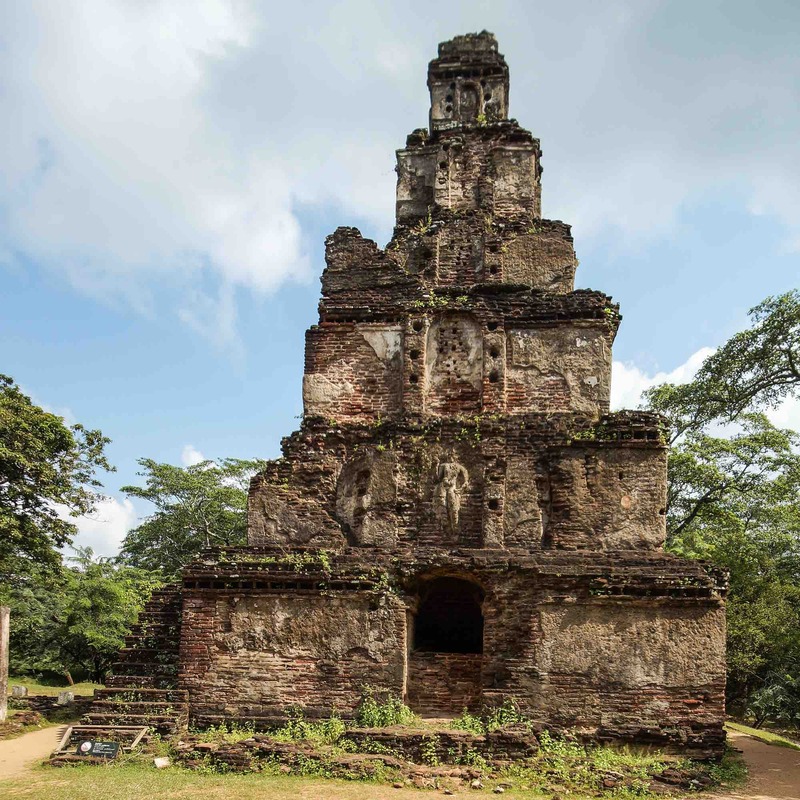 The Vatadage is only one of the structures in the Dalada Maluwa or Quadrangle. Over the next hour I would visit the Hatadage, the Satmahal Prasada, the Nissankalata Mandapa, and Thuparama, which was unfortunately closed due to extensive renovations. 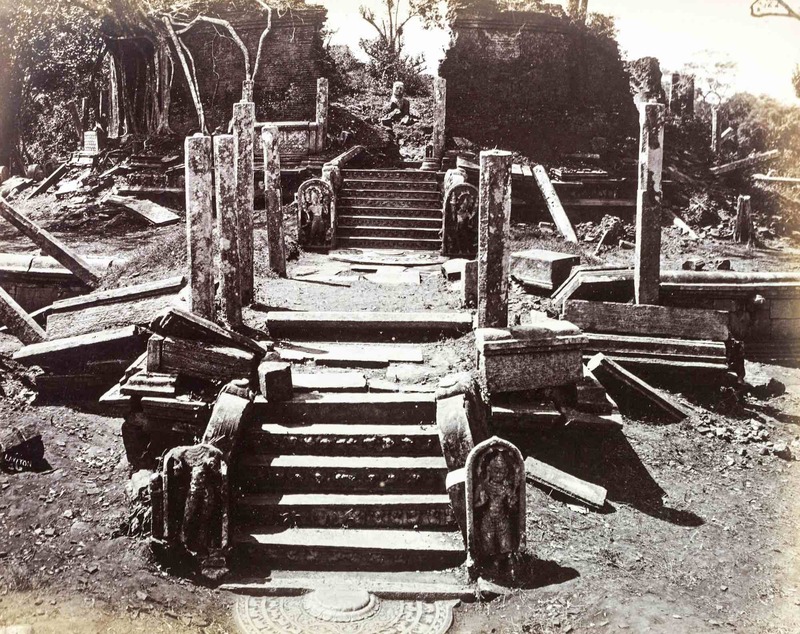 The image below is of the Hatadage, the last of the three Dalada shrines built to house the relic in Polonnaruwa. To the left is the antechamber or mandapa which leads to the main room where the Tooth would have been kept. A curious building – a seven-storey ziggurat! – stands to the side of the Hatadage in the corner of the Quadrangle. Still attached to the front of the second storey of the Satmahal Prasada is the stucco relief of a standing deity or Buddha figure. 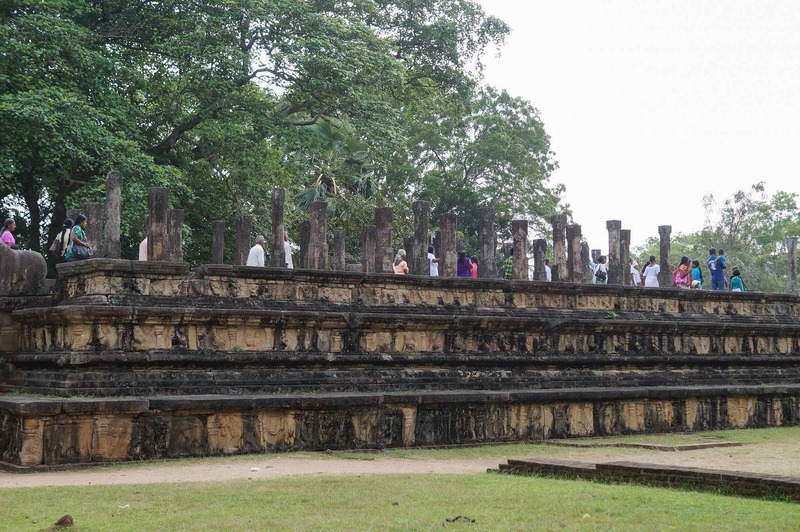 Polonnaruwa – Satmahal Prasada (Seven Storey Temple) – the seventh has crumbled! 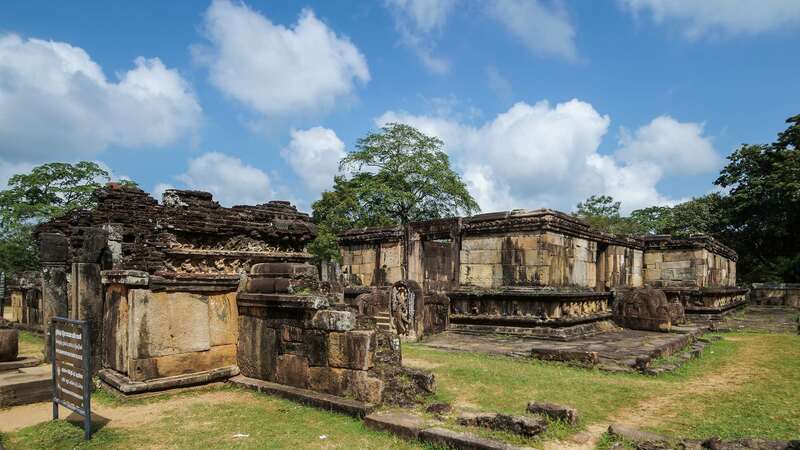 According to The Rough Guide To Sri Lanka, “the ziggurat-like form of this temple is without parallel in Sri Lanka, its unique design perhaps the work of Khmer (Cambodian) craftsmen, although no one really knows”. Also in the Quadrangle are standing columns of other buildings. another view of the standing Buddha in the Sacred Quadrangle – follow the path down to the end! 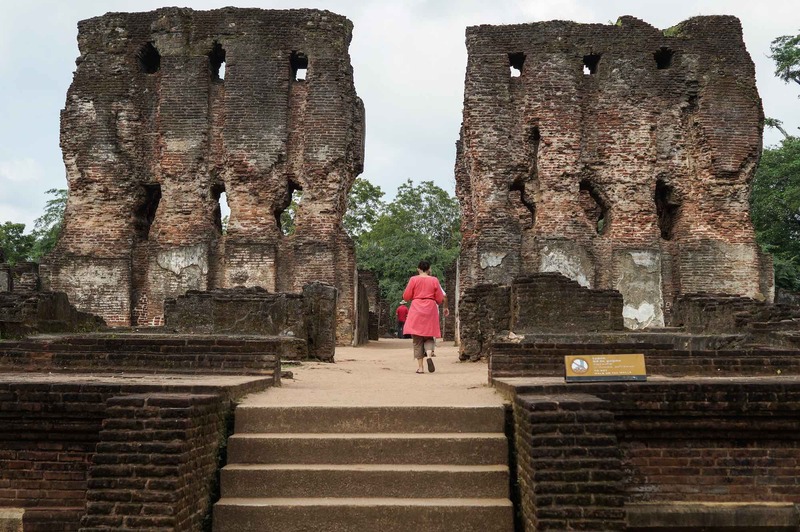 If you are going to visit Polonnoaruwa – and spend the US$25. to enter the site – it would make sense to get as much out of it as possible! The two following books provide the historical context and site details to enrich your visit. An excellent hard copy guide-book to take along on a Polonnaruwa visit is the Rough Guide To Sri Lanka. 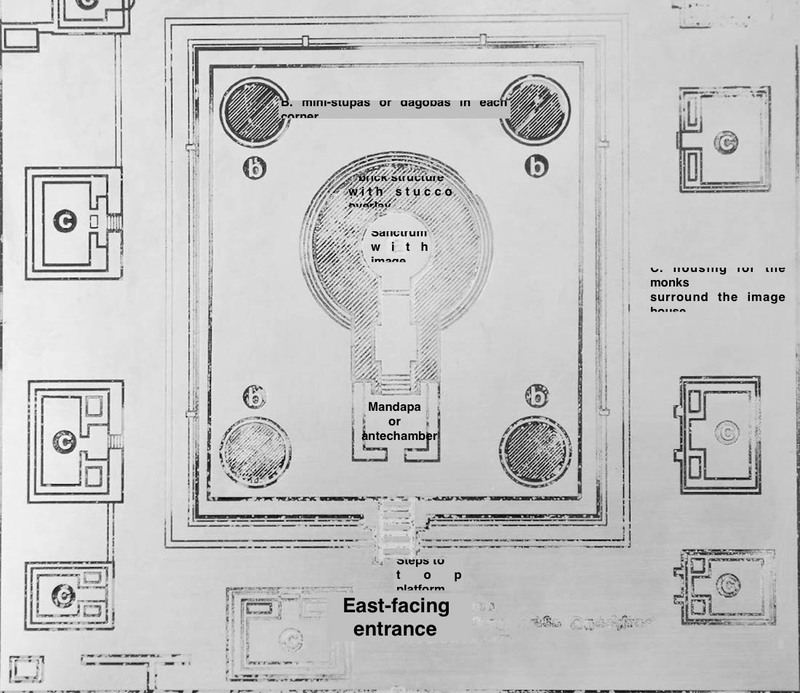 There is a detailed section dealing specifically with the individual structures in the archaeological zone as well as a useful overview map and a detailed map of the Quadrangle. 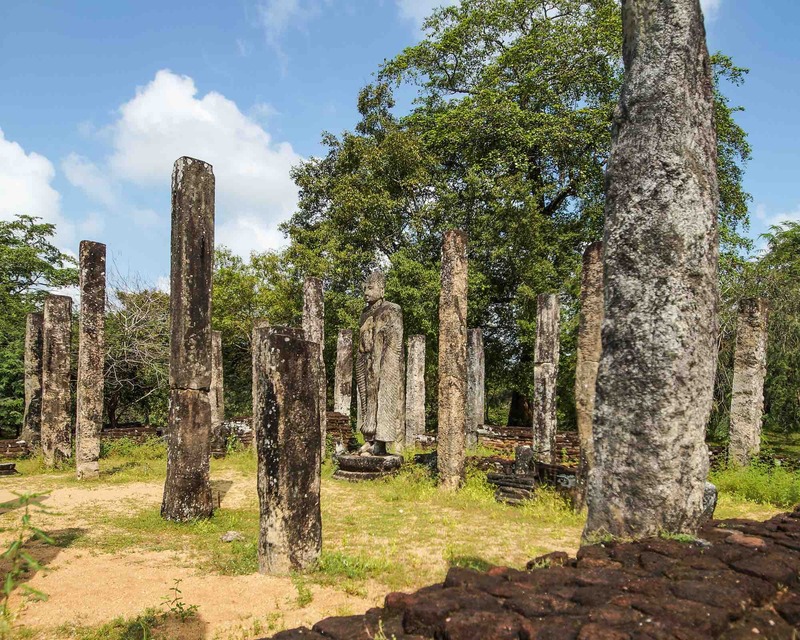 Another excellent source of information on Polonnaruwa and on the other sites in the Cultural Triangle is this digital book available at Amazon in mobi format. The authors are David and Jennifer Raezer and you can find it at Amazon here. If you are an iPad user, having the book and its excellent architectural diagrams and floor plans available as you toured the side would definitely enrich your experience. At $5.99 it is an investment that will repay itself quickly! All of the Joseph Lawton photos come from the Victoria & Albert Museum Collection. 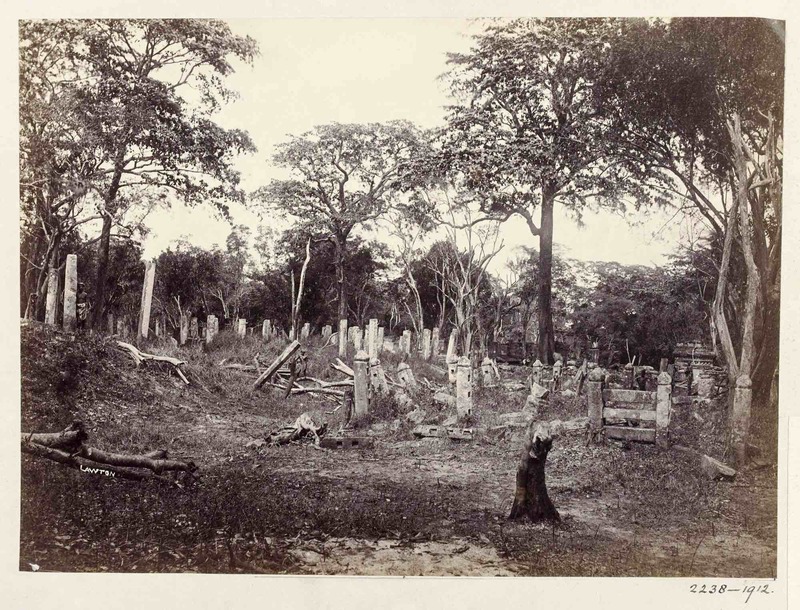 Click here to see the entire portfolio of photographs which Lawson took circa 1870-1871. I did process the jpg files in Adobe Lightroom to correct the white balance, as well as overall exposure levels and contrast. 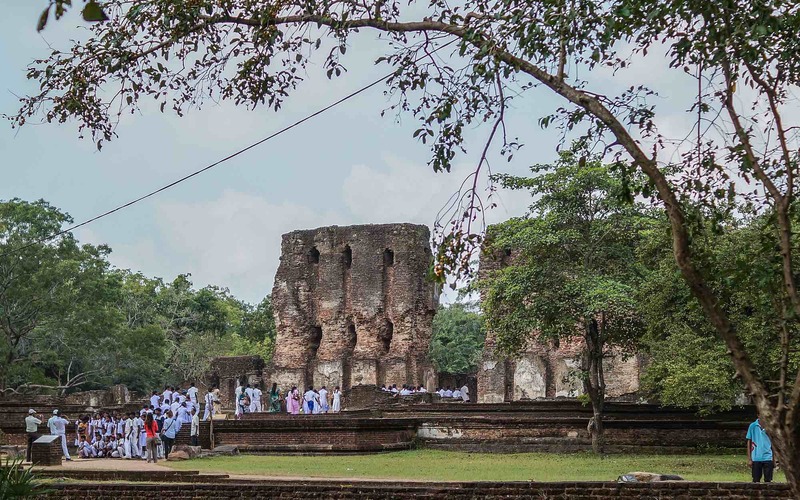 This entry was posted in Sri Lanka and tagged Buddha tooth relic, cultural triangle, Dalada Maluwa, Kumara Pokuna, Lawton photo Polonnaruwa, moonstone polonnaruwa, Parakramabahu I, Polonnaruwa Citadel, Potgul Vehera, Sacred Quadrangle, Satmahal Prasada, Vatadage Polonnaruwa, world heritage city. Bookmark the permalink.